HELSINKI – Metso’s new MHC series hydrocyclones deliver a high unit capacity and exceptional separation efficiency for a wide range of classification duties. They feature optimized process performance, superior wear component design, and improved ease of maintenance. The next generation in hydrocyclone technology is the MHC series from Metso. That means users benefit from improved inlet head design that reduces turbulence, increased unit capacity and reduced liner wear, sharp particle separation at low cost, and increased wear life and improved ease of maintenance to keep downtime to a minimum. This is possible because the entire conical section is constructed into a single rigid component. The internal geometry of the MHC series has been developed in co-ordination with Metso’s world-class simulation and modeling scientists. Through the use of advanced CFD and DEM tools, Metso developed a new inlet head design that delivers increased unit capacity while minimizing liner wear. 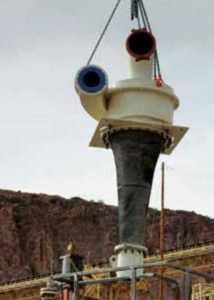 Metso also designed the radial hydrocyclone manifolds to accurately distribute the feed and collect the underflow and overflow from multiple cyclones operating in parallel. Wear resistant linings are incorporated into the feed distributor, as well as the overflow and underflow launders. Metso’s cyclone manifolds incorporate all required work platforms with special attention to safe access for monitoring, sampling and maintenance. The MHC series hydrocyclones come in eight diameters from 100 to 800 mm. To download the MHC brochure, click here.